RIVM manages three population screening programmes for cancer: breast cancer, cervical cancer and bowel cancer. Screening programmes are intended to identify diseases at the earliest possible stage so that prompt treatment can be given. 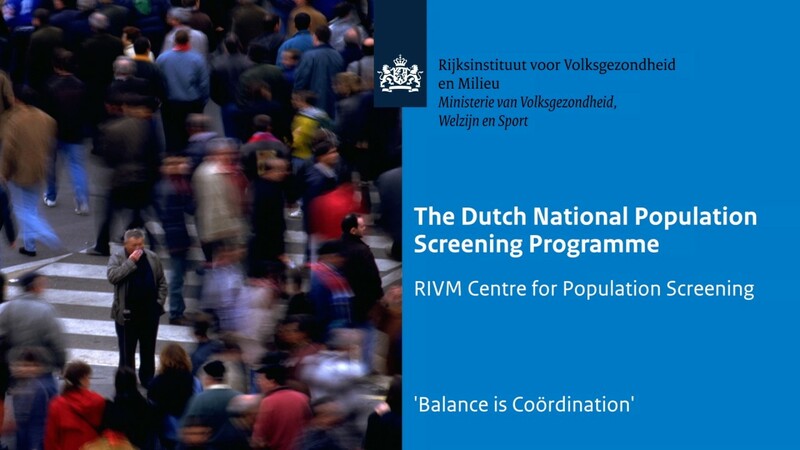 Everyone in the Netherlands – at a certain point in their lives - will be invited to take part in one of the national population screening programs. Most programs are intended to identify (life threatening) diseases at the earliest possible stage so that prompt treatment can be given. The screening programs help to enhance public health. In case of the Down’s, Edwards' and Patau syndromes screening, the program is meant to inform parents on their options. The RIVMNational Institute for Public Health and the Environment Centre for Population Screening (CvB) directs, manages and coordinates the national population screening programs for cervical cancer, breast cancer, bowel cancer, Down’s syndrome screening, the 20-week ultrasound, the heel prick program, newborn hearing screening and pregnancy blood screening. This ensures that the chain of health care providers responsible for diagnosis and treatment can function as effectively as possible. Each link in that chain has its own responsibilities and authority. The centre is also responsible for providing clear public information. In addition to the screening programmes, CvB is responsible for the Dutch national influenza prevention program. It coordinates and directs all these programmes on behalf of the Ministry of Health, Welfare and Sport (VWS). that are offered by the Dutch Government. of the Centre for Population Screening. offered by the Ministry of Health, Welfare and Sport. Each of the seven screening programmes is offered to a unique group of people. without symptoms of the disease under investigation. A large number of organisations carry out the population screening programmes. Each party has its own responsibilities and authority. the population screening programmes contribute to a healthier society. for the national population screening programme. The minister is at the head of the organisation of screening programmes. distributes assignments and finances the programmes. to coordinate the seven population screening programmes. The centre is also responsible for the national influenza prevention programme. through a range of high-quality population screening programmes. within the healthcare system at reasonable costs. and provided the finances to coordinate the seven population screening programmes. and finances to the private and the public sectors. that, in the centre's experience, are most competent. This is often done by setting up contracts or agreements with executing parties. The centre oversees all collaboration and makes sure that it works out successfully. or directs other organisations to do this. Financing is mainly achieved through procurement or subsidies. in regards to the provision of a service or product. For example, a laboratory analysis or a mammography machine. so private companies can compete for the contract to deliver the service or product. is approached to do additional work for the screening programme. will be agreed on, and then the costs for the additional work estimated. for executing or overseeing the procurement and subsidy processes. of all seven screening programmes. for assessing the quality of screening professionals and screening equipment. and regular inspections take place. The assessor optimises and safeguards medical, technical and physical quality. for the quality of entire programmes and designs quality assurance systems. It drafts guidelines, scripts, training and accreditation requirements. within the screening process and the executing organisations. of planning, selecting, inviting and screening the population. on linking the information needed from all kinds of different data sources. With the right information in the right place, key processes can be monitored. and evaluating aspects for improvement. on the key indicators of each programme. These monitors are prepared by independent external parties. and for checking the effectiveness, quality and affordability of the programmes. The centre also commissions scientific evaluations from external research parties. are regularly evaluated to improve the screening programmes. with professionals and with stakeholders. so invitees can make an informed decision on whether or not to participate. The folders are always pretested, using a panel of target group representatives. follows social media and responds to social media. and guides innovations throughout this network. The broad network is proactively maintained. and adapts existing programmes on an ongoing basis. and introducing new screening programmes. from the Ministry of Health, Welfare and Sport on the latest issues. that government policy is implemented. are channelled back to policymakers. and is dedicated to carrying this out in a professional, business-like way. with great passion, expertise and transparency. to public health in the Netherlands.